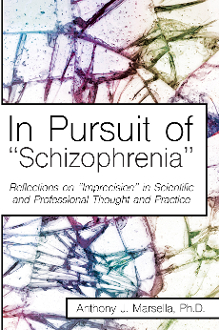 Our Products >> In Pursuit of "Schizophrenia"
Author: Anthony J. Marsella, Ph.D.
the consequences of “imprecision” in professional and scientific thought and practice because of our failure to accept “schizophrenia” is a construct. A construct is a term, word, concept subject to denotative and connotative semantic abuses and limitations. This is the irony and the tragedy, as “schizophrenia” has acquired widespread acceptance and use as a medical/psychiatric/political diagnostic label. ideology, legitimizing medical solutions for critical widespread social, political, economic, and moral problems.